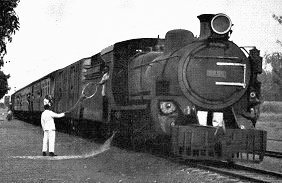 There were two very early railway lines in Uganda. 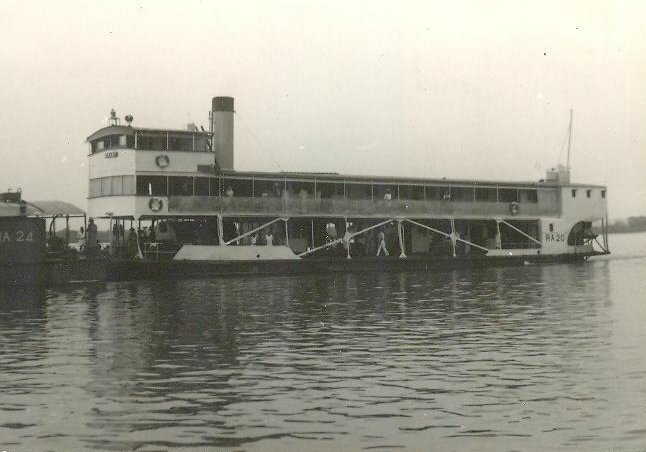 Port Bell to Kampala was one. The other was an earlier line from Jinja to Namasagali via Mbulamuti. We encountered this line as we travelled from Tororo to Jinja earlier in this series of posts. 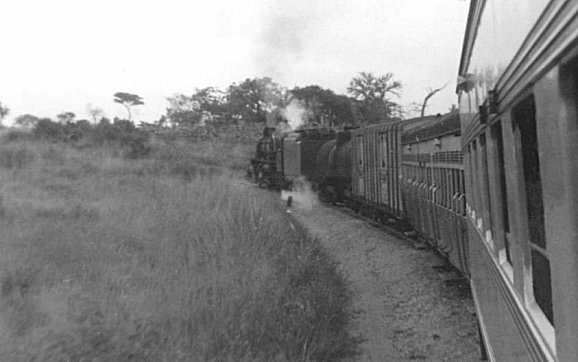 Indeed the original line from Tororo travelled to Mbulamuti to meet the older line from Jinja to Namasagali. At that time there was a good justification for this. 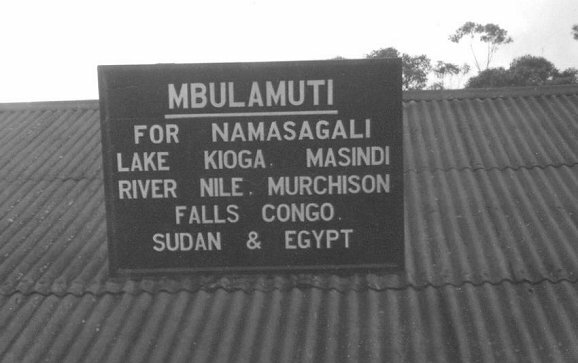 Namagali was a significant point on an ‘overland’ journey from Mombasa to Cairo! 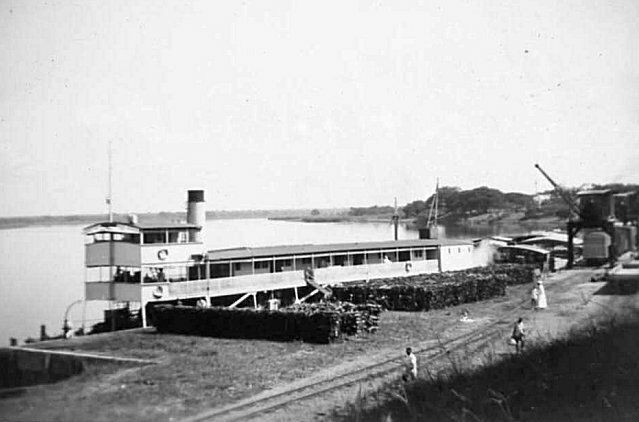 Meeting the line from Jinja to Namasagali at its mid-pint allowed easy access to both significant destinations and beyond them to the Nile and to Lake Victoria. 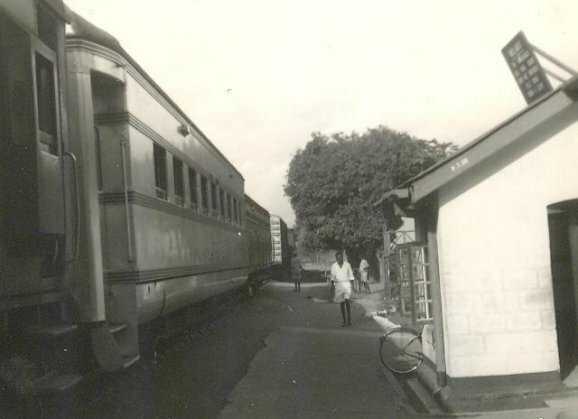 Until the early sixties the main line from Jinja ran to Tororo via Mbulamuti which was the Junction for Namasagali. 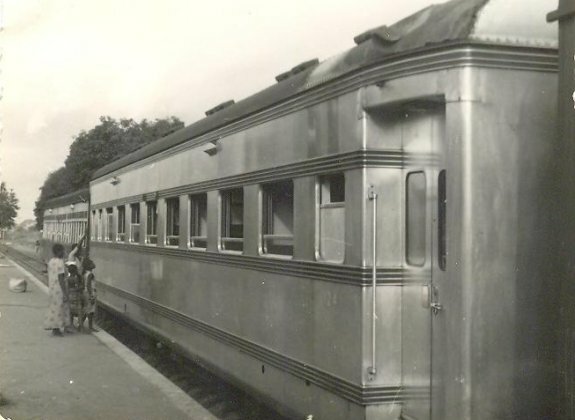 At one time it had been possible to travel in a through first class coach from Nairobi to Namasagali, the coach being detached at Mbulamuti and added to the 3rd Class service which ran from Jinja to Namasagali. 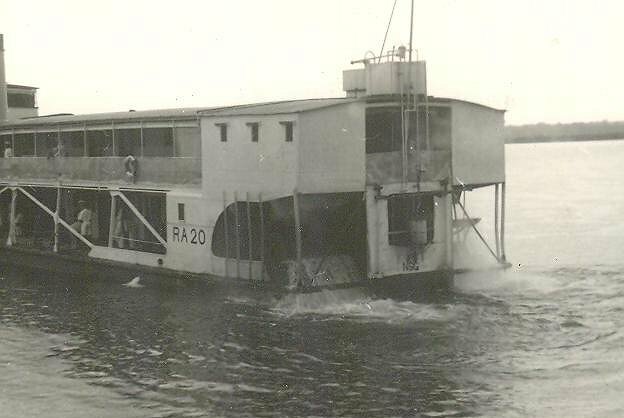 By 1962 there is no mention of this service in the timetable, nor of sailings between Namasagali and Masindi Port. So, we will begin this post by focussing on Mbulamuti. 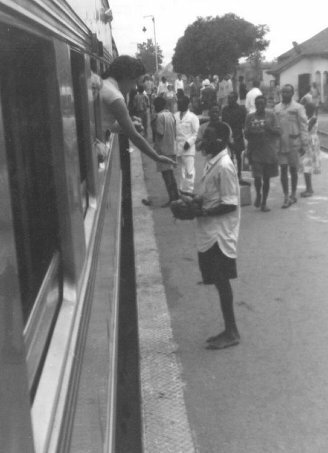 Mbulamuti was busy when trains stopped at the station. It is sad that all of this activity has ceased and that Mbulamuti no longer has a place on the country’s rail network. In the image below a local goods train from Jinja pauses at Mbulamuti en route for Namasagali while Tribal Class 3110 Bakiga waits at the platform, (c) Neville Webb. 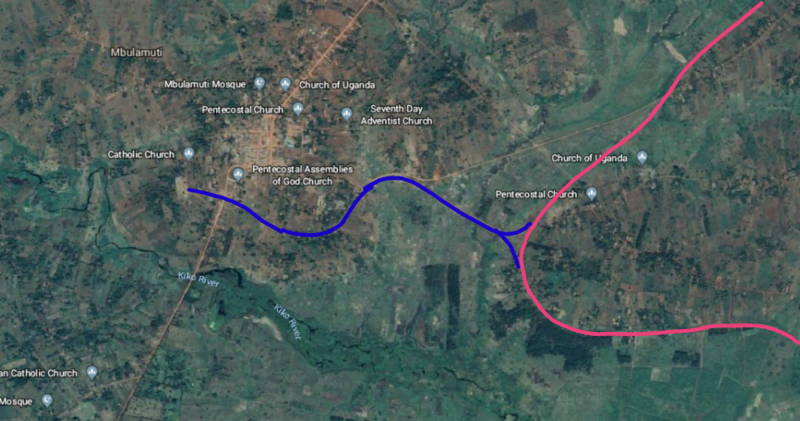 In the satellite image below, the pink line represents the route of the old Tororo to Jinja line and the blue line represents the first part of the branch-line to Namasagali. The town of Mbulamuti is visible at the top of the image, left of centre. The station, in later years, was on the mainline. The branch, which was once the mainline, travelled to the south of the township and we will pick up its route on other satellite images and maps as we progress along the route. The map below is an extract from OpenStreetMap and shows the old mainline (in dark grey) and the branch (as a light-grey line to the northwest of Mbulamuti). 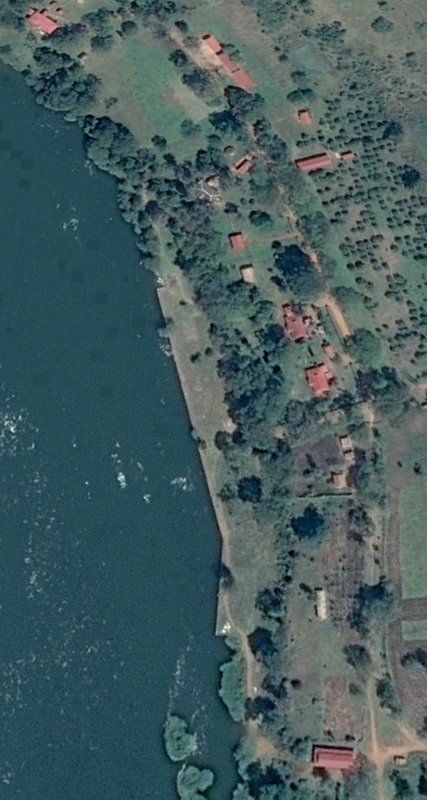 The River is the Nile flowing north from Jinja. The route from Mbulamuti starts from south of the town, travels up its east side and then meanders following the countours as much as possible towards Namasagali. 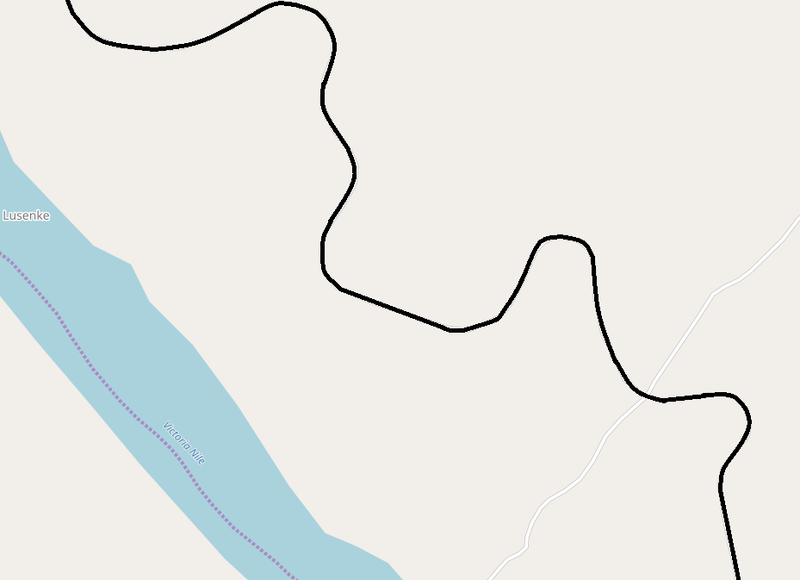 The railway formation has been converted into a murram road which snakes through the landscape as shown ont he adjacent larger scale extract from OpenStreetMap. 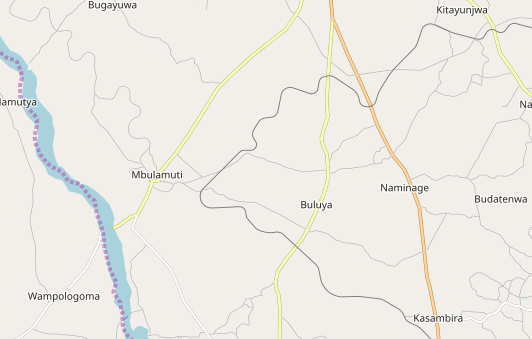 Mbulamuti is in the bottom right corner of the map. 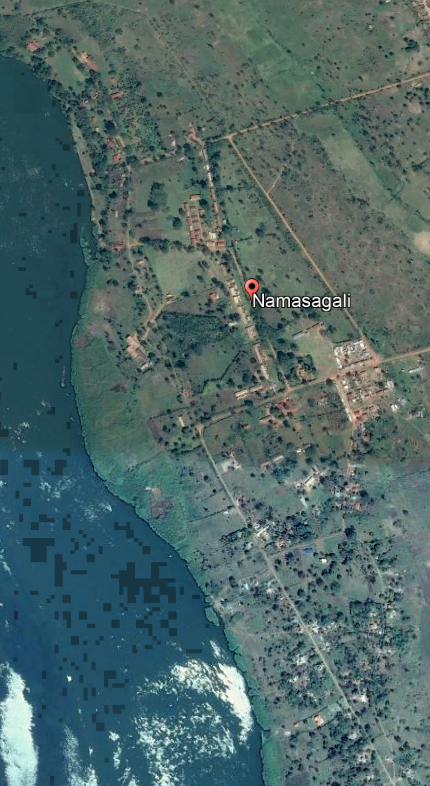 Namasagali is shown in the adjacent satellite image. The route of the railway is shown as a road which is a straight line heading north-northwest alongside the river to a point approximately in the centre of the image. At this point the road turns to the west and the line of the railway continues north-northwest to what was the station and port area. The site of the port and station is shown as a larger scale image below. 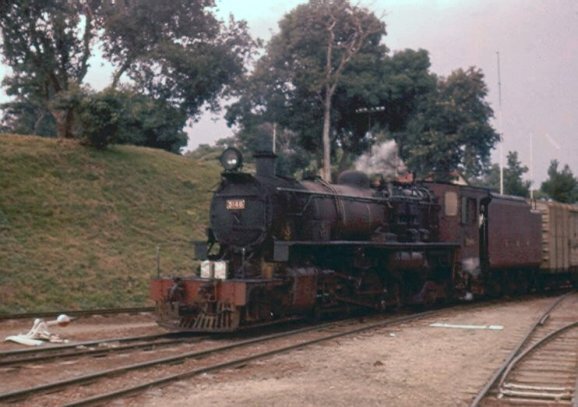 http://www.mccrow.org.uk/EastAfrica/EastAfricanRailways/Mbulamuti_Laropi.htm, accessed on 10th June 2018.
http://mccrow.org.uk/EastAfrica/EastAfricanRailways/UgandaBranches.htm, accessed on 1st June 2018.
https://ekitibwakyabuganda.wordpress.com/2013/02/12/railway-station-at-namasagali-where-from-people-took-the-ferry-1950s, accessed on 12th June 2018.
http://www.energeticproductions.com/EARandH/Vol4-4.pdf, accessed on 12th June 2018.
http://www.mccrow.org.uk/EastAfrica/1920s%20Uganda/1920s%20Uganda.htm, accessed on 12th June 2018.
http://www.mccrow.org.uk/EastAfrica/EastAfricanRailways/EARAlanThompson/LakeSteamers.htm, accessed on 12th June 2018. This entry was posted in Railways Blog, Uganda and Kenya Railways on June 12, 2018 by rogerfarnworth. Hi Roger, a friend of mine has forwarded much Namasagali information you have archived. l have taught at Namasagali since 1975. My life in East Africa, mainly in Uganda, began in Tanganyika when I had a gap year 1962 to 1963 as an administrator in Muyenzi Camp for Rwandans, That was an experience I can never forget! One last point. Jon Snow wrote a book called Shooting History about his VSO year at Namasagali in 1968, when Rev. Father Damian Grimes MHM, MBE, was HM. Looking forward to your response. Cheers, Simon Downie. Edgar Almeida here. 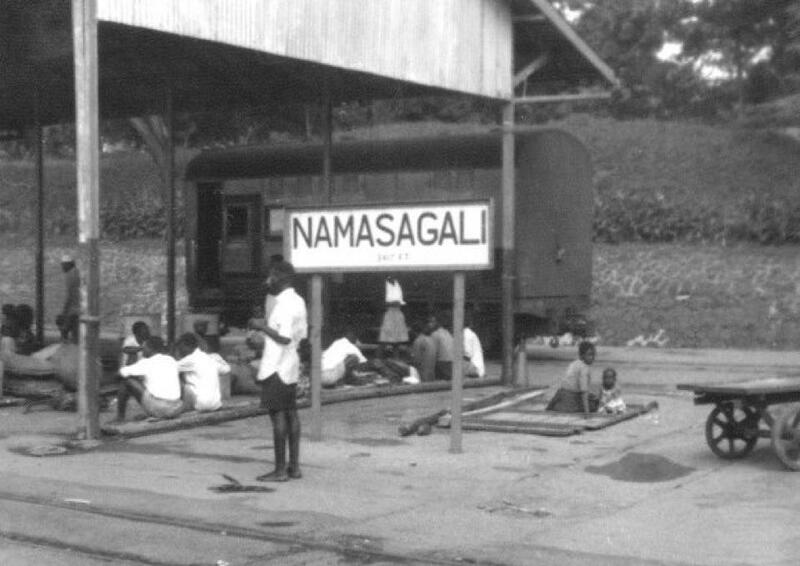 I was a student at NC eons ago and am still thoroughly fascinated with the Pre-NC history of Namasagali Port. 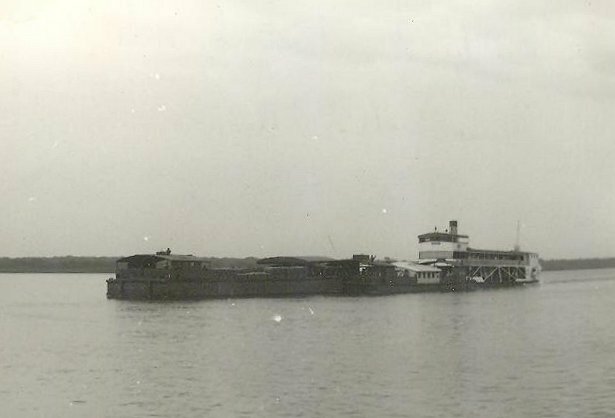 Would you happen to have any old images of the port or thoughts on the location of port infrastructure? 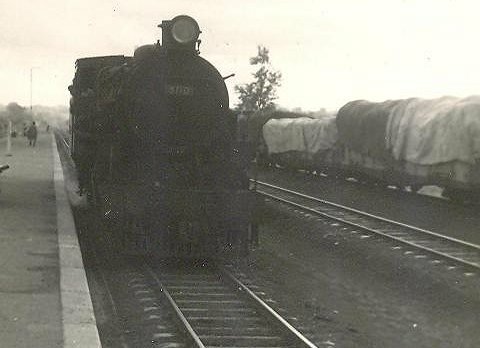 Are you aware of any old photographs of port facilities such as the locomotive turntable, repair shops, staff facilities while it was operational? 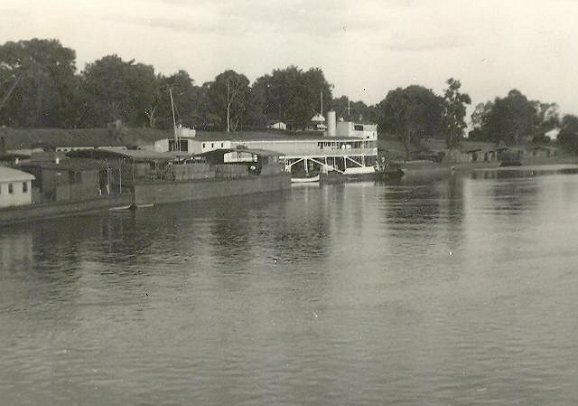 I’m really interested in the history of Namasagali Port prior to its closure caused by the River Nile flooding of the early 1960s. Any information will be deeply appreciated. Sorry, I have put everything I found into my post. It might be that you know more than me and can ask better questions of search engines. There is a possibility that I ignored some pictures in my searches if they came up as ‘All rights reserved’ on sites such as Flickr and SmugMug, etc. 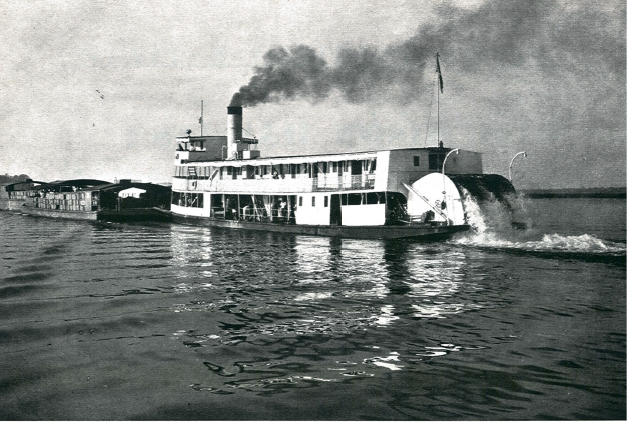 The Namasgali link predates the main railway and was used by traffic from Jinja to access the wider network of rivers and lakes to the north.